I fell in love with breadfruit in Jamaica a few years back, so when I came across breadfruit in one of my local grocery stores recently, I was elated. 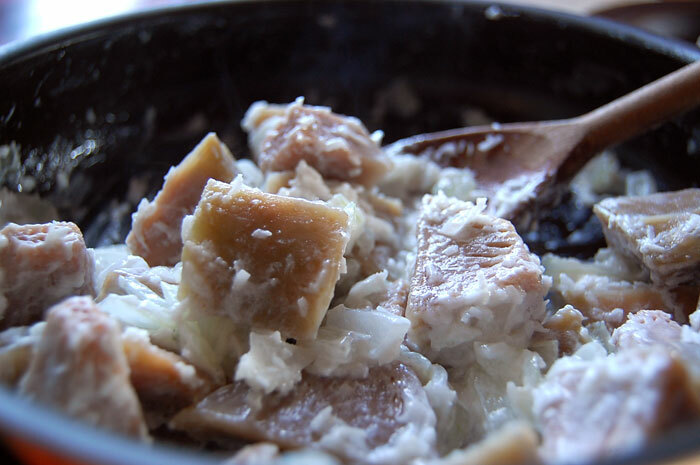 I decided to make my version of Fa’alifu Ulu, a simple Samoan breadfruit dish. “Fa’alifu” is a savoury coconut sauce and “Ulu” is breadfruit. You can use this sauce with any starchy vegetables or fruit like sweet potatoes, yams, Chinese taro root, and even bananas. If you use bananas, use green bananas that aren’t ripened yet. The cooking process is the same no matter what you use. First, fill a large bowl 3/4 of the way with water. As you peel and cut the breadfruit, you will need to put the pieces into the bowl of water to keep the fruit from going brown. If you don’t care too much about the fruit browning a little you can skip the water bowl. Next, peel the breadfruit with either a vegetable peeler or knife, then cut the breadfruit in half lengthwise from the stem to the bottom of the fruit, and then in half again. You’ll notice there is a centre core in all the pieces – cut that out like you would an apple core. Cut the quartered pieces in half again lengthwise and chop the breadfruit into chunks. 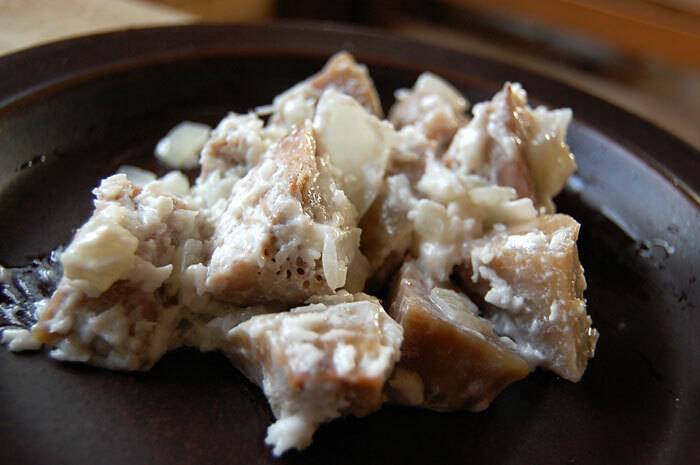 As you finish chopping each slice of breadfruit, you can put the chunks into the water. When you are done chopping, place all the chopped breadfruit into a pot of water. Turn the heat on high, cover the pot, and bring the water to a boil. Once it starts boiling, turn the heat down to medium and let the breadfruit cook until it is tender. Meanwhile, you can prepare the fa’alifu (coconut sauce). Open your can of coconut milk. With a fork, scoop out the cream from the coconut can that is on the top of the can (most of the coconut water will have separated to the bottom of the can), and put it into a medium sized bowl. I use a fork so any coconut water I capture drains back through into the can. I like using only the cream for a thicker, richer sauce, but if you prefer a thinner sauce, you can just dump the whole can into a bowl milk and all. Chop up your onion and add that to the bowl. Give the onions a stir in the coconut cream/milk and then add the salt. Generally around 1 teaspoon of salt is sufficient, but if you’d prefer a saltier flavour, add more. If you want to include the optional ingredients, add the coconut flakes and/or chives at this point. Thoroughly mix everything together. Hands are encouraged. Not only is it more thorough and fun, but you can lick your fingers clean when you’re done. If you have kids around, they’ll love this. By now, your breadfruit will have been cooking for about ten minutes. Check on it to see if it’s ready. You can stick a fork in to test the texture. It should be like a cooked potato. Once the breadfruit is cooked, drain the pot of the water and turn the heat up slightly to medium-high. Slowly pour the fa’alifu over the breadfruit. Keep stirring the breadfruit and turning the pieces over in the sauce so every piece is covered. The sauce will thicken slightly at this point, and when it does, you’re done. If it doesn’t seem very thick to you yet, not to worry, once it cools you’ll find that it will thicken considerably. As an aside: If you prefer the thinner sauce, the main difference is not to cook the coconut sauce for as long (cook for about 3-5 minutes). Then, when you remove the pot from the heat source, put it to the side, and cover it with aluminum foil and let it rest for about 5 minutes. You can adjust the cooking time according to the thickness of the sauce you want. This dish can also be served chilled in the summer as a salad, or changed slightly into a curry just by adding a little curry powder and chili flakes. If you’re interested in the curry variation, heat up a 1-1/2 teaspoon of vegetable oil in a small saucepan and add 1 teaspoon of curry powder and a dash of chili flakes and sauté the mixture in the oil. Add this mixture to the fa’alifu and breadfruit when you mix the two together in the pot. This entry was posted in Mains, Sides, Vegan, Vegetarian and tagged breadfruit, coconut, coconut milk, fa'alifu, samoan, ulu. Bookmark the permalink. I have never even heard of breadfruit…I’d love to try it! I hadn’t either until our trip to Jamaica. It’s fantastic. I wish we had more of it where I am.